Settling deep in the fanciful mist, Sapa offers tourists a poetic still-life painting adequately describing the true beauty of a heaven on the earth. 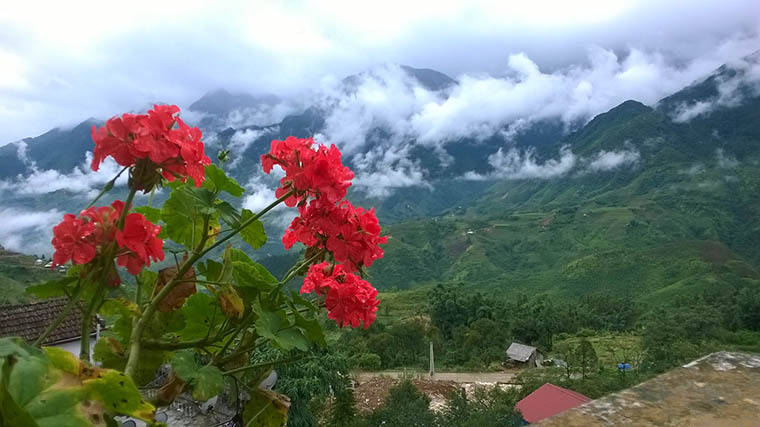 Depart from Sapa town, passing through many rouge passes, along the mountain cliffs, travelers will come across the touristic sight of Muong Hoa valley. Once landing here, they will be amazed and surely have their heart set on the pristine beauty of this serene valley. 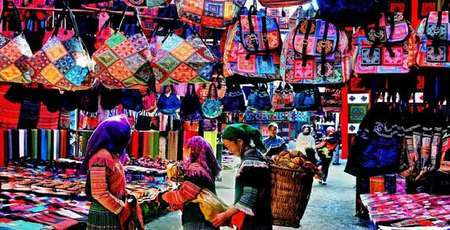 Let Authentik Vietnam Travel take you to Muong Hoa valley through the article bellow! 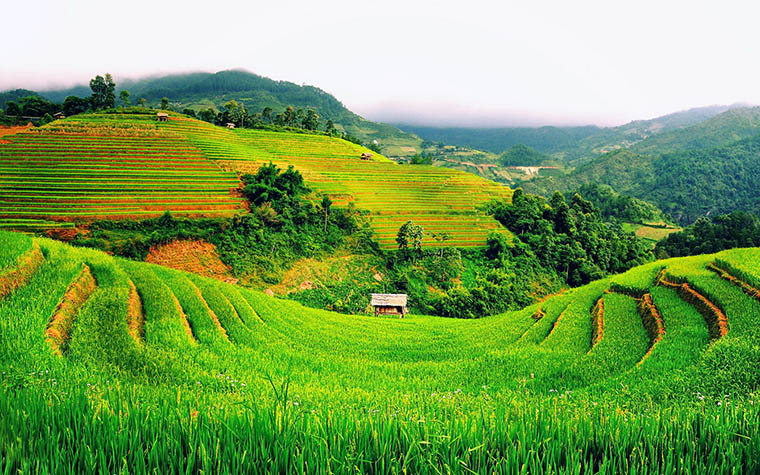 Positioned further 10km away to the South East of Sapa town, Muong Hoa valley belongs to Hau Thao province and has become one of the most ideal stop for many tourists, especially those in love with mysterious beauty of the mountain region. Obviously, the mother of nature has endowed this dream land with promising beauty and the power to take away the breath of visitors at the very first sight. 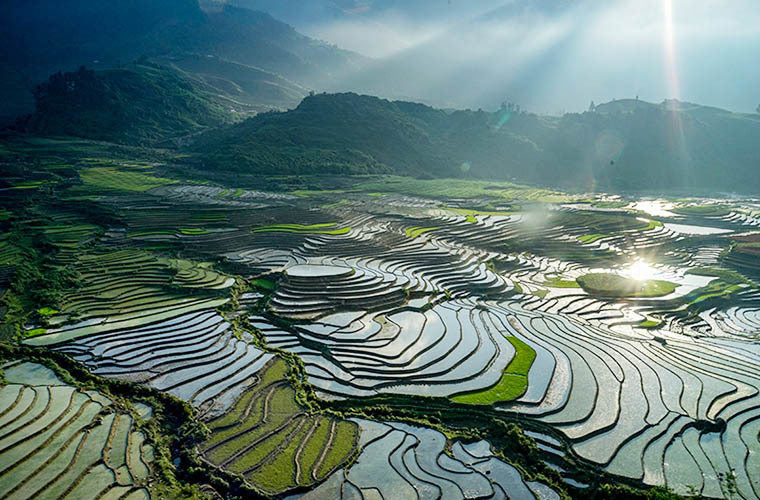 The delightful sights of Northwest mountainous region often remind us of the sparkling golden rice terrace in the harvest season and the green fields in the rainfall season. 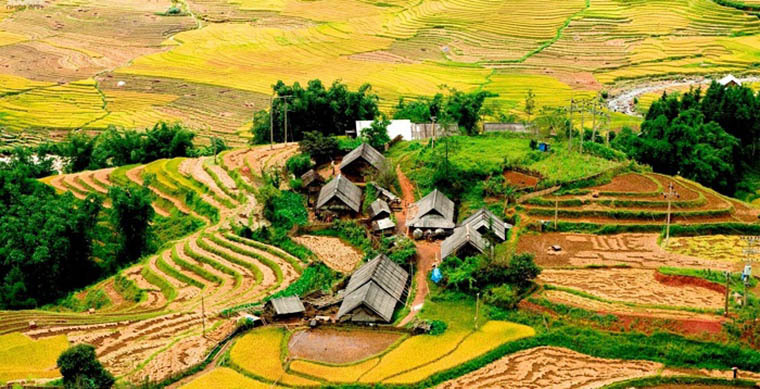 Visit Muong Hoa valley, you can admire different color of Sapa gorgeous rice fields. 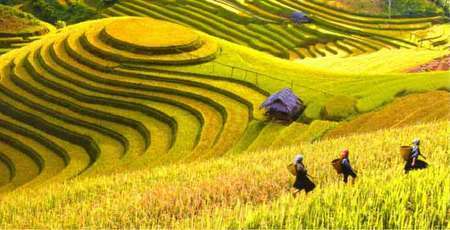 Coming to Muong Hoa valley during June and August, tourists will encounter a golden rice terrace shining under the gazing sun, together with the fragrant of ripe rice floating in the air. 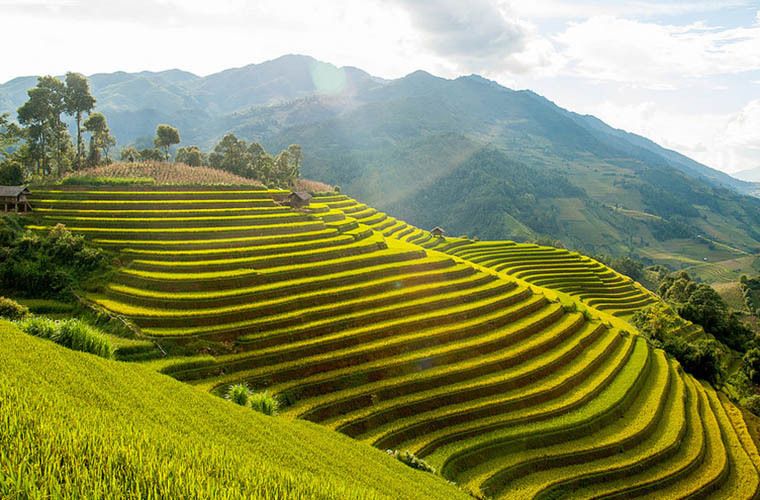 Unlike the harvest season, rice terrace in Muong Hoa valley displays a luxuriously green during the seed-time, creating a perfect harmonization with the lively green of majestic mountain region. In the course of rainfall season, all rice paddy fields become the places for water reserve, looking as if the giant mirror that reflexes the pure sky. In contrast, when winter falls over the mountain, Muong Hoa valley is covered by the white color of snow. What makes Muong Hoa valley more attractive to tourists is nothing rather than the jewel-blue streams drizzling onto the rock; and the sparkling golden rice paddy fields under autumn sun. 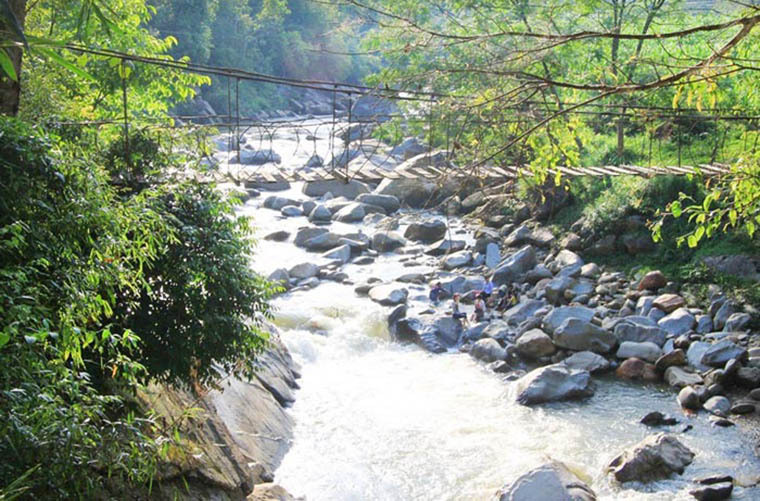 One of the most magical stream in Muong Hoa valley is the Hoa stream or so called the Floral stream. The flow of Hoa stream usually begins at Hau Thao, Lao Chai, Ta Van and stops by Bản Hồ, carrying on it the adorable beauty all year round. To assist the daily activities, the villagers has built up a wooden bridge across the stream line, giving tourist chances to have a better exploration over the valley. For those are fan of photography and urging to seek for the best photoshoot, this is the right place for them. What is more? 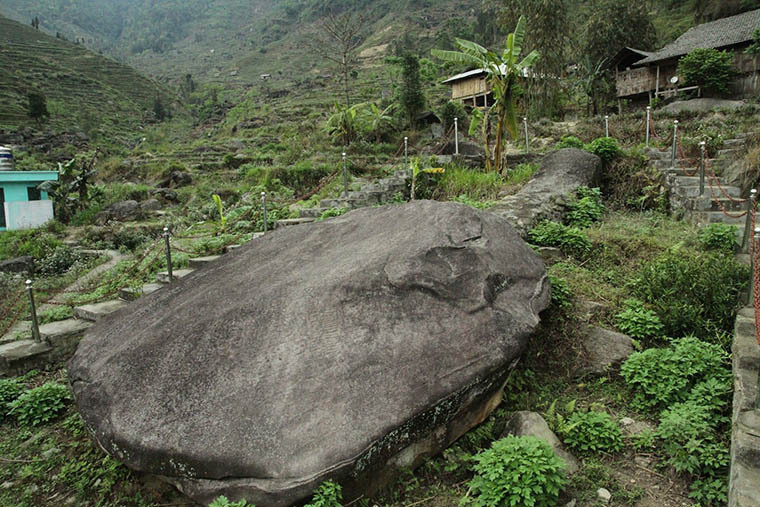 Muong Hoa valley also sweeps tourist off their feet by the dreamy of ancient stone fields with various color and shape. It is where the footprints of elder generation are remained centuries by centuries. 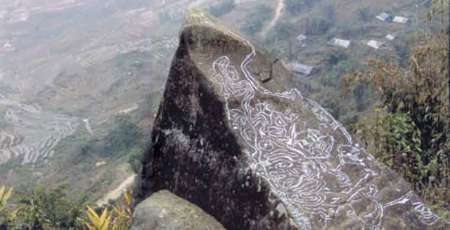 The ancient stone field does not only carry the artistic value but also the psychic and cultural value. 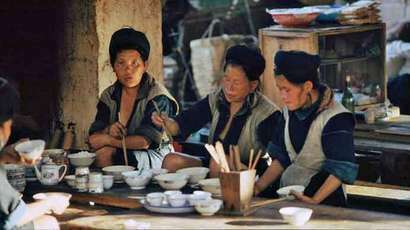 Thus, in 1994, it was recognized as historical relics at national level by the ministry of culture, sports and tourism. There aren’t any word that descriptive enough to describe the graceful beauty of Muong Hoa valley. 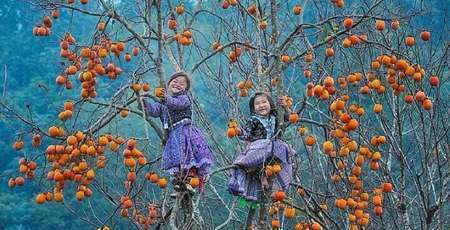 To have a better understand of the ethnic life of Black Hmong, Red DZao and Giay, there is no better way rather than staying and sharing the moment with them. Even though the local people are busy with farming work, they will be willing to wave you hello and show you the way they cultivate the rice terraces. 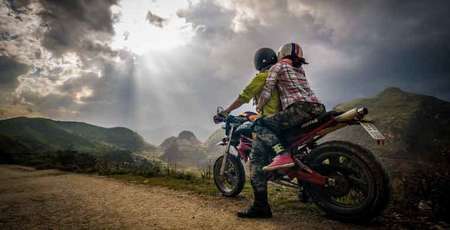 For any tourists visit Muong Hoa valley in the spring, they will have a chance to immerse into the festive atmosphere. In short, Muong Hoa valley was generously endorsed by the mother of nature, which take away the breath of many travel lovers. Spending a day to fullest feel the breath of the forest and admire the peaceful beauty of Muong Hoa valley will not disappoint you.